Please RSVP to reserve your campsite! Email us at info@washingtonclayarts.org to save your spot! Enjoy Camping Over the Weekend! Hiking around Millersylvania State Park followed up by s'mores by the campfire. Hang out with your clay crew and enjoy the beauty of the Pacific Northwest! Workshops at Arbutus Folk School during the day, and then join together for a Potluck Dinner. We will provide hamburgers & salad. Please bring a dish to share! We will host our Annual WCA Meeting and have a cup swap before the potluck dinner. Bring a cup to swap! Potluck Breakfast, followed with a Surprise Outing and Treasure Hunt! We will announce the location of our surprise outing/treasure hunt during the breakfast, so stick around for the details! The workshop day will consist of two demonstration workshops with 4 presenters. Aisha Harrison is from Olympia, Washington. She received her MFA from the University of Nebraska- Lincoln, BFA from Washington State University, and a BA from Grinnell College. She has been a resident artist at the Women's Studio Workshop, and Baltimore Clayworks. Currently she teaches at The Evergreen State College in Olympia, Washington. Joe Batt, is originally from South Dakota. He received a BFA from the Univ. of South Dakota and a MFA from the University of Montana. He is full time art faculty at South Puget Sound Community College in Olympia, Washington. He has taught widely in the PNW. Joe has been an artist in residence at the NCC in MN, and at Watershed in ME. Colleen Gallagher studied ceramics with Ka Kwong Hui at Rutgers University and studio art in the MFA Program at Pratt Institute in Brooklyn. She earned her MFA from the University of Puget Sound, where she met John. They have both been potters for 27 years! John Benn built his first wood kiln in 1976. He studied with F. Carleton Ball and Ken Stevens at the Univ. of Puget Sound in Tacoma, and with Howard Shapiro and Sandra Simon in the MFA Program at the School of the Art Institute of Chicago. John and Colleen's work has won awards in the US and internationally and can be seen in private collections, museums and public art projects. Read on to find out more information about each artist! Artist Statement: I am interested in the experience of power and privilege derived from an individual’s race, class, and/or gender identity. Almost every interaction we have has a power dynamic, even the ones within ourselves. My goal is to examine how my own privilege and the privilege of others affects me and those around me. The sculptures do not illustrate actual interactions; instead I place the figures in situations that get at the emotional impacts of privilege. I use materials and surfaces metaphorically. At the most basic level, the brown bare clay refers to my own brown body. The bare clay surface is never extremely smooth or refined. Instead of mimicking skin, I want the gritty, spotted clay to refer to all the elements that come together to make us who we are. In addition, the paradox of the fragility and the incredible strength of clay mirrors our own bodies and psychological states. In my most recent body of work, I have covered all or parts of the pieces with salt. The salt is both beautiful and dangerous. Salt is necessary for us to live, and yet it is poisonous to us in large quantities. If you salt the earth, nothing will grow. Tying into the history of salt as a marker of privilege, I think of this salt as a residue of the effects of privilege. Many of us focus on the privileges of others (that we don’t have), and yet we rarely examine how we benefit from the privileges we do have. The residue (of having or not having) privileges follows us even after we die. It affects the narratives about our people. These narratives influence our understandings of ourselves, as well as other people’s perceptions of us, our ancestors, and our descendants. Artist Statement: My narrative ceramic sculptures combine various recognizable images such as people, animals, and manufactured objects, to make compositions which appear to make sense. I am inspired by social issues, the figure, nature, childhood, and the impacts Digital Age. I have always gravitated toward the figure and bright colors, possibly the influence of watching many after-school and Saturday morning cartoons as a child. I come from the Midwest and relate to the color and distortion of the Chicago Imagists like Red Grooms and Jim Nutt. Art teachers turned me on to the Pop sensibilities of Robert Arneson and other “California Funk” ceramic artists. Edith Garcia and Arthur Gonzalez have also inspired me with their robust storytelling sensibilities. The work is usually pinched with stoneware, and surfaces are embellished with colored pencils and pastels. I enjoy the use of color and line on clay. Many of my more recent pieces have very little color, which I also enjoy. 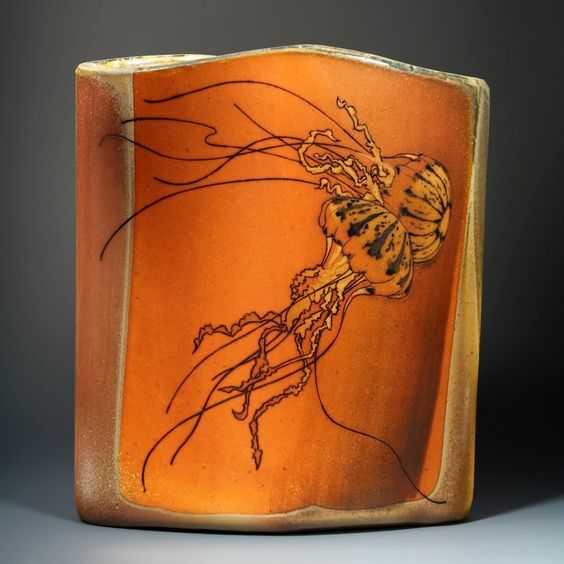 Artist Statement: On beautifully forested Harstine Island in Puget Sound in Washington State, John Benn and Colleen Gallagher make pottery and architectural tiles by hand. They have built a two-chambered wood kiln and a wood-fired salt kiln. The sometimes difficult quest for elusive ash-glazed and vapor-flashed clay surfaces demands hard work, long hours and a willingness to be a partner to the fire. In a converted boatbuilding workshop on Harstine Island in Puget Sound, John Benn and Colleen Gallagher make woodfired pottery and sculptural tiles. They dig several local stoneware clays and fire their wood kilns longer and hotter than is considered wise. "The compulsive and inefficient nature of the woodfire process connects us closely to the earth. We dig local clays. We fire using trees from our forest.We submit the work to our kilns to be reborn as a permanent object that records the touch of our hands and the fire and ash that have transformed it.We control choices of clays, shapes, glazes, kiln structure, type of wood, stacking method, duration and temperature of the firing. But we must also give up control to violent forces of nature. The wood kiln is not a tame beast. It gives us accidents and blessings. We find beauty in imperfection. Our commitment to wood firing is obsessive and non-intellectual.We discover our pots in addition to creating them."